Beginning college in fall of 2006, riding Seattle on a Saturday morning. 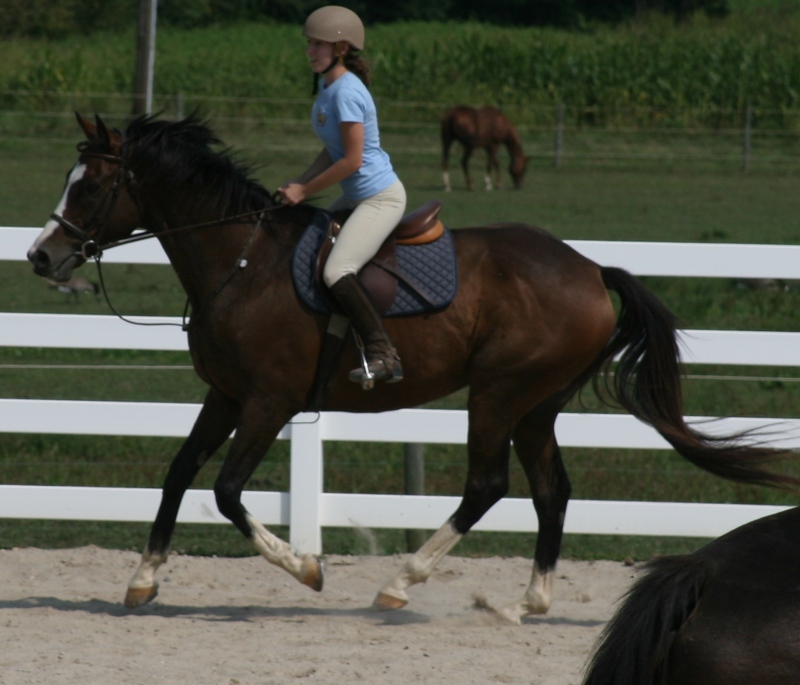 The point of this post is that I need recommendations on new half chaps. You may now either head straight to the comments, or continue on. I promise lots of pictures of pretty horses if you stick around! They're Dublins, the $30 sort of suede kind, given to me as a gift by my mom's childhood horsey friend, Dawn, when I started college. They've served me so well over the past six years, it's really remarkable, but the zipper finally broke on one of them. And now, a photo timeline of my half chaps and our adventures. In 2008 in Italy, after finishing our trail ride through Chianti. In 2009, in jump class on Flash. In 2010, when I was first learning to jump on Bubba. In 2011, on Connor, before I even knew he'd someday be mine. In 2012, shortly before their death, on my new love. We've been through so much together, and they've lasted so much longer than they should have. I'm half tempted to get another pair of them. I knew nothing when I got them, hell, I put them on backwards my first day at college and Mary was the only person that day to tell me how to put them on correctly (before I really knew her, this is how I know we were meant to be friends from the beginning). But they did wear out and start looking fuzzy/shiny, and again with the whole credibility thing: I need more. So, what half chaps do you ride in? What brand has held up well for you? And most importantly, does it come in small/short? When I shopped for leather half chaps to wear at shows, Dublin offered the most size options. Ariat has some too. I used to have a pair of Tredsteps that I loved, but they were given so I don't know about sizes. Happy Hunting. I have heard good things about Tredsteps, they are on my list to investigate. Ariats, too, since my Ariat paddock boots are basically extensions of my foot at this point, but I've heard the zippers don't last. I have dress boots for when I want to look fancy/nice, so I just hang out in the cheap, $30 suede(ish?) half-chaps the rest of the time. So far mine have lasted me 2+ years, and are the only original piece of equipment that I still have/use since day 1 from when I got into riding. They're by Thornhill USA. First of all, I was surprised to hear you've only been riding for two years. You write and ride like someone with much more experience. I'm like you in that my half chaps are just for schooling since I also have tall boots, so I'm basically looking for something nice enough to not embarrass Naomi in public, and durable enough to last. I haven't heard of Thronhill, but they're on my list now. Thanks! I'm so glad I got a response from you, though I assumed it would be anti-half chap based on the opinions of the other UL dressage riders I know! I had not heard of Petrie's, or even considered stiffness to be a point for consideration, but it does make sense. I'm still schooling Dressage in floppy field boots, so I don't really know what it's like to ride in stiff boots. Care to explain why the stiffness matters beyond personal preference? I had a pair of Ariat half chaps for 6, going on 7, years. They never broke and I wore them almost every day. I wore them in rain, bad weather, hot humid summers, and rode in them a LOT. I did take meticulous care of them and cleaned them off every single time I wore them. I loved them and was convinced I would wear Ariats forever! :) I had a kind that they no longer make but they were around $150 when I bought them and were all leather, made to look like tall boots when worn. I'm sure they have something similar now but under a different name. That being said, I got Tredsteps as a hand me down (from a 12 year old, ironically...) because the kid was getting out of riding and I LOVE them. They fit like a glove! I have the "Tredstep Deluxe Half Chap" (http://www.smartpakequine.com/tredstep-deluxe-half-chaps-3216p.aspx?cm_mmc=Google-_-Rider%20Gear_Pos1_MBR-_-Tredstep%20Half%20Chaps-_-+tredstep%20+half%20+chapsiq_id=36565209) They are super comfy and while I can't comment on their lasting ability, I've had them for about 2 years now and they're in darn good shape still. If I had a buy a new pair, I'd try both Ariats and Tredsteps on... but the Tredsteps fit me perfectly so I'd probably leave in that direction! Sorry about the awkward comment structure above, it turns out that the mobile version of my site has comment threading, but my custom layout on the full site does not. Replies were to, in order: Nicole, Steph, Kelly. Becky, you have confirmed what I am already thinking, thanks for the input. Those Tredsteps are exactly what I'm looking for, especially since they come in brown. I may need to save some pennies for them, but I don't mind riding in tall boots for a while. If you're interested in tredsteps, keep an eye on Tack of the Day (tackoftheday.com) as they recently had discounted tredstep half-chaps . They also sometimes will have other brands.